Even after a special report by CNBC, the price action in the chart snapshot at 11:20 a.m. of General Motors stock (NYSE:GM, TSX: GMM) remained stoic without any major bump to the upside. Regarding stock price dynamics, it’s not unusual for traders to buy on rumor and sell on the news, as it appeared to do at today‘s open. This report, however produced no grand price moves, even after 30 minutes of the announcement. That may change as auto analysts digest to details. 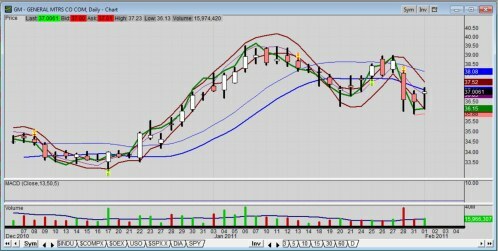 Nonetheless, the chart snapshot shows GM stock up from the open only slightly, and only slightly hovering above yesterday’s high. The gap on the open from Monday’s close, though, was the bulk of the price dynamic. For the month, overall GM fleet sales were down 7 percent with sales to rental fleets declining 11 percent, while sales to commercial customers rose 7 percent. Retail sales of GM’s cars, trucks and crossovers all rose 34 percent or more during the month, up 39 percent, 34 percent and 35 percent, respectively. The day chart shown shows price support between 35.89 - 36.27, most recent swing lows. GM stock appears under pressure by all the news of Egypt and commodity prices, including oil and gasoline. It will likely take general market momentum to help GM stock overcome last Friday’s down bar on higher than average volume. Bullish forward-looking statements will help, too, if there are any; as sales reports are looks into the rear-view mirror.